Top 5 Trends of Muslim Wedding Invitations! Top 5 Trends of Muslim Wedding Invitations that give perfect style to your Nikah! Wedding day is one of the most important & special day in everyone’s life. Every bride & groom plans their wedding with a lot of enthusiasm. The focus is on creating unique and memorable experiences for everyone who attending the wedding. It means you need to put extra time and efforts on choosing décor, food, attire, wedding invitations and more. When it comes to Muslim weddings or nikah there are so many things to be kept in mind. Muslim wedding invitations always play a crucial role of inviting friends & relatives on the special day of couples. No matter your faith, but if you are planning a muslim wedding in a modern style besides of traditional one; 123WeddingCards bringing the latest 5 trends of Muslim wedding invitations that will surely add an extra charm to your wedding. 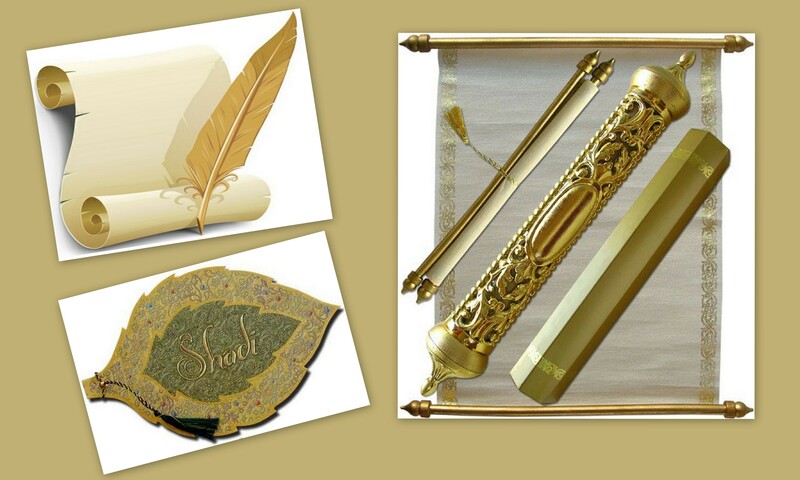 Add a small touch of royalty with scroll style Muslim cards. Scroll cards are also known as Farman; this type of invitation is symbolizing elegance and royalty. You can select the cards with made of velvet, handmade & vellum paper. So get ready to leave an everlasting impression on your wedding guest with these modern & Classy Muslim Wedding Invitations. Peacock inspired wedding themes are always in trend and gives fresh feel to everyone. A most intricate peacock theme Islamic invitation has just the right touch of grace, card fascinates by image of peacock on the center. Give your wedding contemporary touch with stylish wedding wordings on peacock theme cards as per your wedding theme. This design of Muslim wedding cards typically called as Carrey in the Urdu language. It is a curved tear drop kind of design, which has become a very popular trend you can pick out bright silver embossed over a backdrop of navy or indigo. Yes I know you always believe in high values & simplicity, and then surely you should go with handmade paper cards with paisley crafted with kundan. Muslim weddings have so much influenced by the Afghans and Moghuls that’s why we can’t ignore certain designs i.e. leaves, domes, feathers imprinted on the Islamic cards. You can even jazz up your wedding card by adding Urdu poetry to it. You are going for a royal & modern muslim wedding, right? Then how you can forget to include add on cards in your wedding. In old muslim weddings add-on cards don’t have so much value but now you can add, Thank You Cards, RSVP Invitations, Menu Cards, Place cards and so on to give a fresh feel to your wedding. These add-on cards not only give your wedding contemporary feel even a sophisticated look also. So feature your wedding with these fashionable Islamic themed wedding invitations and make it remarkable. Hello Hemant, there are different cards in this blog, can you specify which card cost do you want to know?? If you are not comfortable to choose your card design. Just contact our 24*7 Customer Support Team, they will surely help you! !